Welcome to the 3rd event of the 4 event Bay Area Ridge Trail Series. And, the second annual Saratoga Trail Run at Sanborn park. This park is special to the new owners of PCTR, because of the fun enjoyed here as a child and in later adult adventures. The park has grown over time and provides one of the best staging areas for any trail race. 90% of the trail you will experience will be under the canopy of the beautiful redwoods and lush forest. Choose 30K, Half-Marathon, or 10K. Either way, you will be challenged all while enjoying the scenery and fellow trail runners. Everything right about trail running is found here: a celebration of community, the strength of the human spirit, the environment, and a very challenging event. This trail race takes us back to the beginning of ultra-running: a purposely small and intimate event, capped at 200 runners. This is the original Skyline to the Sea trail run! 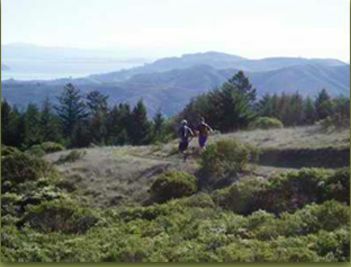 The trail begins at Saratoga Gap and descends from the Santa Cruz Mountains to the deep blue Pacific Ocean. 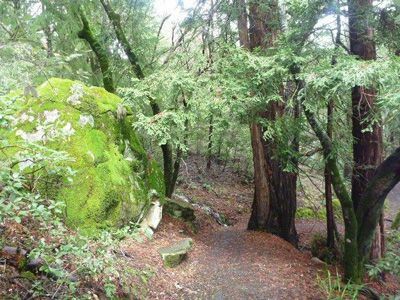 Along the way you will encounter amazing views of the Monterey Bay, coastal and redwood forests, lush ferns, chaparral, exquisite sandstone formation, crystal clear waterfalls and the beauty of California wildflowers. This gorgeous venue is not to be missed. Come join Monica Imana along part of the Skyline to the Sea 50k course. Great event organized by Pacific Coast Trail Runs. Join us in 2017!! Enjoy vistas of the Pacific Coast as you take a scenic tour of the spectacular Marin Headlands with views of San Francisco, Tiburon, the Golden Gate Bridge and California coastline. The course is a 25-mile loop. For the 50, 75 and 100 mile distances, the first loop is clockwise. Then the course reverses direction to counterclockwise and alternate (“washing machine” loops). Marathon runners will add a 1.2 mile loop at the start before beginning the 25-mile loop. The Ridge will be one of those races that you will keep saying, the views, the trees, the event was amazing from start to finish. We hope to see you there. Ask any veteran ultra/trail runner, and they will tell you point-to-point courses are their favorite. Shall you choose the 62K from the city of Lagunitas at Samuel P Taylor Park or the 32 K from Mt Tam or the 18K from Tennessee Valley, you will run to and finish at San Francisco's Crissy Field. All participants will have the option to take the shuttle. This means reserved your spot now in registration mode, unless you have a friend to drop you off. Come run the ancient trails of the Pomo people. You will go back in time as you witness the wonder of rugged coastline, sandstone cliffs, kelp-dotted coves, tide pools, pygmy forests and panoramic views. August along the coast normally makes for favorable weather for a fast run. These pristine and historic trails should be on every trail runner and ultra-marathoner's bucket list. We will cap this event at just 200 runners, combined for all distances per day to keep this a special and intimate experience.